If the people of Habayit HaYehudi and their allies really felt it important to select a Zionist Chief Rabbi this time around, it should have been fairly simple to for them to get that accomplished. They should have decided who they would promote, even coming to a conclusion prior to the election if not shortly after, and quickly after the formation of the government just push it through. Instead, there has been fighting among themselves and then with the others whom they thought were their allies. There have been deals and backstabbing, name-calling and accusations and threats. Candidates are coming and going and coming back. The entire process has turned into an embarrassment. I hope they wont be running every campaign and effort in a similar fashion. As it is, they do not even deserve to have their candidate, whoever it might eventually be, as the Chief Rabbi, and with all the potential for deal-breaking and backstabbing, it is probably more likely that they will be surprised to find a Haredi Chief Rabbi than to find one of their own end up in the office. And they will deserve it. Chabad has now found a way to get hold of a Google Glass (is it a pair of Google Glass? Google Glasses? a set of Google Glass? just "a Google Glass"? what's the correct usage?) and turn it into what they are claling the "Google Glass Tefillin Stand". The Chabad rabbi on the campus of Stamford University has somehow gotten a Google Glass, and has publicized around campus that anybody who wants to give it a whirl is welcome to do so - on condition that they come to the stand and put on tefillin, along with reciting the shema, which would be displayed on the screen (lens?) of the Google Glass. The rabbi said "many Jewish students who had never wrapped Tefillin before came out to do so." "Some of them told me it was their first time wearing Google Glass and Tefillin,"
I wonder how many non-Jewish students put on tefillin also just to get the opportunity to try the Google Glass. All Things Digital is reporting that Waze has cut off talks with Facebook, rejecting their bid. The reason is, supposedly, that one of the conditions of the deal that Facebook was insisting on was that Waze relocate their headquarters to the USA. Waze insisted on remaining in Israel, and this was a deal-breaker. They rejected a $1-billion offer over this! After months of negotiations, Facebook is no longer in talks to acquire Waze, the Israel-based social mapping and navigation startup, according to sources familiar with the matter. The two companies had been in discussion for a potential acquisition, with a price tag that could have reached up to $1 billion. But the talks dissolved in recent days, according to sources, due in part to conflicts over whether or not the Waze team — which is predominantly based in Israel — would move over to the United States and fold itself into Facebook’s Menlo Park, Calif., headquarters, among other reasons. Reps from both Facebook and Waze declined to comment. Totally unexpected and out of the ordinary to reject such a mega-deal over such a clause. Israeli pride and patriotism in ths day and age, especially when everyone is upset about tax increases and brain drains and all that, yet Waze chooses to stay in israel despite all that, even giving up all that money in the process... unbelievable! 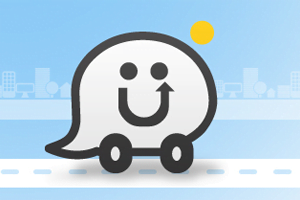 Waze was already a great app and a great successful company Israelis could be proud of. Now they [might have] given us another reason to love them! This is the latest pashkevil up... it announces the existence of a "Charedi underground" called "Machteret Negged Giyus Charedim" - or, "The Underground Against the Drafting of Charedim"
the Charedim will take revenge! I hope the pashkevil is either an empty threat or a fraud. Some people need to get off their ladders and talk rationally to each other and work out an acceptable system to both sides. The Conversation is listed as a book of fiction, because the philosophy is couched in a story, but do not doubt that philosophy in the book is far more dominant than the fictional story in which it is couched. The story makes it readable - to non-philosophers, but the story is clearly secondary to the philosophy. David breaks up with his girlfriend as his search about Judaism becomes more intense. Eventually he begins to focus almost completely on Jewish philosophy, develops a relationship with an Orthodox female student, and finds mentors to add to the professors he talks with. David eventually learns of an Orthodox cousin, and later in the book makes a connection with him as well, which greatly influences David and his studies. I don't want to give away too much of the story, so I will leave it at that. for a philosophy student, David seems kind of lacking. Almost all the philosophy in the book is presented by teachers and mentors, and very little by David. As the main character of the book, and a philosophy student, I would have expected him to discuss philosophy himself, and argue with others. Mostly he is listening to philosophy and asking the occasional questions. Not a big deal, but I would have expected more of his character. I don't get how the relationship with Esther, the Orthodox student, went from friends to an expectation of something more (from her side) that appears later in the book. it almost comes out of nowhere, and it seemed very abrupt. When David meets his cousin, Chaim, Chaim begins to teach him kabbala. I don't get that - Chaim is presented as extremely Orthodox - even learning in kollel and writing a mussar sefer - yet he meets this not frum kid studying philosophy and starts to teach him kabbala right away, even after realizing that David had barely even learned any gemara or most other standard Jewish texts? It seemed a little strange to me. Despite these questions, the story of the book is actually pretty good. It definitely makes the book readable to a non-philosopher like me. And, some questions left open at the end of the book leave room for a sequel! Regarding the philosophy aspect of the book, The Conversation is a powerhouse. David learns his philosophy mainly from Professor Maimon, Rabbi Low - a philosopher who is now a rosh yeshiva in Israel, Rabbi Abraham - a rabbi on campus, his cousin Chaim who takes on a central role in the last 30% or so of the book, and some fellow students. the philosophy discussed is very deep, which is actually why it took me a long time to read. The philosophy was so in depth that for the first about 60% of the book I could not read more than 2-3 pages at a time. I particularly liked David's discussions with Professor Maimon and his correspondence with Rabbi Low. the role of Professor Maimon actually surprised me, as her character eventually becomes clearly that of a Conservative Jew (based on how she explains her belief of the Oral Torah, the Written Torah and even of God), or something close to it, but in her role she is very influential on David through their discussions. David regularly took thoughts from his discussions with Professor Maimon and shared them with Rabbi Low for clarification, and obviously we then got the more classical Orthodox explanations. The philosophy was very deep, and not being a philosopher, I can offer no comment on how thorough it was, or argue with the content. I would add that having a yeshiva background, which means I never studied philosophy and even Jewish philosophy is barely broached, it was a fascinating read and caused me to think about manyof the issues discussed. I would not say I understood every point, but overall this book was not just a novel and a piece of fiction, but a book that makes one think. The story was good, and the philosophy was deep. I recommend this book to any thinking-Jew. here is a beautiful video of Prime Minister Benjamin Netanyahu meeting children with special needs for their bar and bat mitzvah celebrations. How could I not post this after seeing what the young boy says near the end of the video after Netanyahu offers them to sit around his table and be Ministers, even PM, in the government for a day! He is just a private guy, though he is involved somehow in TOV, so I don't quite know why anybody cares what he thinks (just like I don't know why anyone cares what I think), but Yeruchem Estreicher from Bet Shemesh is against the new "Equality of Service" law that passed the committee vote yesterday.. He speaks well and with confidence..
6. who makes the best kosher hot dog in America? perhaps they did not include Romanian because it is only sold in Chicago, but it should definitely be on the list, if not at the top of the list! 7. is shorter hesder service morally defensible? 11. is it bizarre to prepare your kids for annihilation? 18. the sefer Torah is how old? It turns out that the Chief Rabbi of Kiryat Ono, Rav Ratzon Arusi agrees with me, sort of! Rav Arusi also thinks the politicians should not be involved, but for a slightly different reason. Rav Arusi says the Rabbanut should be outside of the realm of the Knesset because there are kofrimi inside the Knesset. Rav Arusi said, "When there was a Sanhedrin, it would give instructions and make decrees regarding the selection of judges and members of Sanhedrim and for any religious issue, because the Sanhedrin operated according to the Torah and anything it did was from that perspective. In the State of Israel we have merited on the one hand from sovereign rule in the land, which according to Rav Kook has the status almost of a kingdom and form that perspective can establish laws that are meant to obligate its citizens. But on the other hand, one cannot ignore the problem that the parliament of today consists of representatives of the entire spectrum - Jews and non-Jews, religious and secular and some with different worldviews and even those who oppose and are deniers of the Torah, all within the framework of pluralism. [While they should be encouraged to continue establishing appropriate laws], we would expect the Knesset to understand the sensitivity of the issue of over-legalization regarding a religious institution that has its own uniqueness to it... The lawman must know not to get involved in these issues, just as he does not get involved in issues of the courts. If he did that, there would be an outcry. It is a shame that the State of Israel limited rabbonim based on age. As the rav gets older, he gets smarter and has more influence. The only limitation should be on actions. When you want people to do things your way, you probably should not call them insulting names (like kofrim), but his point is correct. "found" is a funny word to use, considering the Torah scroll was there all along. They say "found" because, despite, it being in their archives for so long they did not realize how old it was until now. They say it had been mislabled, and they had thought it was just a few hundred years old.. However, when Mr Perani recently re-examined the scroll, he realised the script used was that of the oriental Babylonian tradition, meaning that the scroll must be extremely old. Penina Rosenblum, former Israeli actress, fashion model, politician, media personality and always a businesswoman, sells a line of hair products - shampoos and conditioner - under her name. Upon hearing that in the Haredi neighborhood in Ashdod stickers were being affixed to the bottles of her product to cover up her image, Rosenblum gave one of the smartest responses I have heard. Many would be insulted and threaten to remove the product from the area if the locals continue to deface it.. Rosenblum said, "I am selling this shampoo all around the country for 25 years already and haven't had a problem anywhere. Machsanei HaShuk is a chain of stores we work with a lot, and is a chain that hasn't had a problem in any of its stores. Maybe n the area of this specific store there are some more religious people, even though I am not exposed in the picture, it is only my face. But what is most important to me is that they buy the shampoo. Wherever there are religious people who want to put a sticker on the shampoo, I have no problem. The main thing is that they buy my shampoo." I think the Yated must be undergoing some changes...and becoming more liberal in the process. they are now at least more liberal than the Hamodia newspaper. 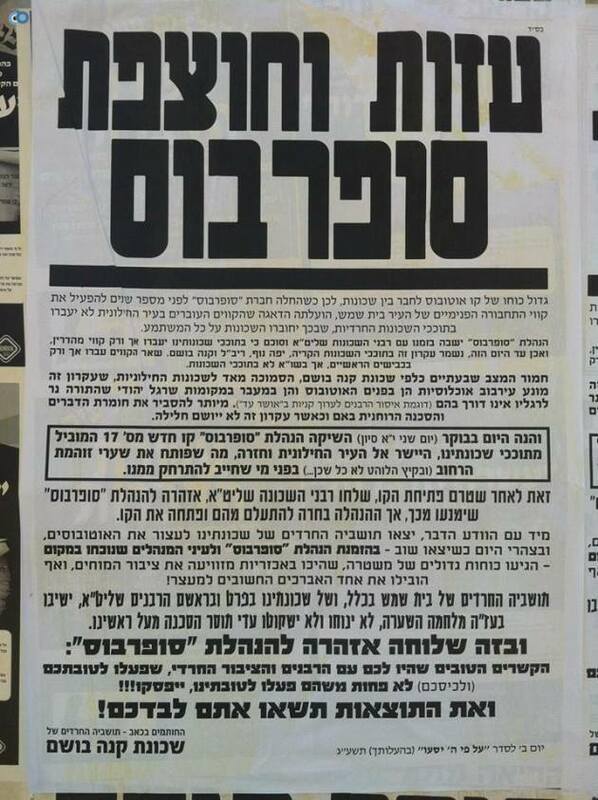 They will soon be going out on a marketing campaign billing themselves as the newspaper for the liberal Haredi. 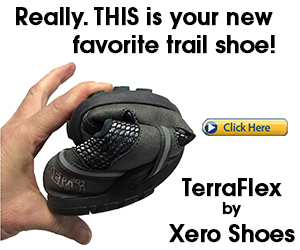 A few months ago Hamodia printed an image of a drawer of shoes with the womens shoes edited out. While the policy had been to blur out images of women, they took it to the next level when they edited out the shoes. Yated Neeman however printed the following picture in their newspaper yesterday. If you look carefully and pay attention to the details, you might notice that they took a picture and swapped out a female protester for a male protester. Though they swapped out the protester, they left the original lady's shoes. So, Hamodia wont print pictures of womens shoes, but Yated will. Clearly yated is more liberal than Hamodia! Last week, MKs Lipman and Zeev held a joint interview/debate on Knesset TV.. this is a follow-up interview/debate.. Lipman pulls a move that surprises Zeev, and he doesn't know how to respond. and he just participated in the World Economic Forum in Jordan as part of the young leaders group... He described United Hatzolah to the Queen of Jordan, who expressed interest in establishing something similar there, and he offered his services to help set it up. As part of the "reforms" passed by the Finance Ministry, the VAT will be going up on June 1 from 17% to 18%. Does anybody remember when it was actually dropped a few years ago from 16% to 15.5% with a timetable of it being lowered even further in the following years? Since then it was raised back to 16%, then 17% and now it is being raised to 18%. By law, when the VAT is changed, prices must be updated immediately. That means on June 1, at midnight, all stores must have already, by law, updated the pricing of the products on their shelves. The problem is that Friday is May 31, and Shabbos is June 1. That means, according to the law, there will be a lot of chilul shabbos involved in the changing of the prices this week. Stores will have to hire extra employees to work Friday night to change all the prices in time for midnight. MK Nissan Slomiansky (Habayit Hayehudi) realized the problem and petitioned the Finance Minister to therefore postpone the VAT increase to June 2, in order to avoid potentially mass chillul shabbos. Lapid agreed, and the VAT increase was delayed by a day. Just a few days ago I mentioned the [Haredi] woman in Tzfat who is making a run for a seat on the City Council, despite the opposition of some of the men, and despite being relatively new to town and hardly known. Mynet has now followed up with the story, considering the publicity she has received over the past week. Shira Georgi's candidacy for City Council is largely being met with skepticism within the political community of Tzfat. The Shas representative has a sharper take on the candidacy than just skepticism. Zeev Shvavo says that "women in Shas do not have the luxury of making choices. Their place is in the house. It is not for naught that we do not have female representation in the Knesset and in the various City Councils, it is by the decision of Rav Ovadiah Yosef who believes the tzniyus of a woman is more important than anythign else. She claims she wants to advance issues of the women - might one think that we in Shas aren't concerned about proper representation for our women? She would be smart if she would connect to one of our representatives and advance her issues through him... I myself am prepared to bring her to Rav Ovadiah Yosef or to Aryeh Deri and she can ask them, despite my not having any doubt as to what their answer will be." A former mayor of Tzfat dismissed Shvavo's claims, saying in the past women have served on City Council and it is important that women continue to do so. Shira responded to Shvavo's attack on her saying "I would remind him that women in the haredi community mostly go out to work to support their husbands learning Torah. So it is ok for us to go out to work, but not ok to work for the public? If a woman wants to stay home, she is welcome to. I am not going to do that and I would recommend to Rav Shvavo, who is seemingly afraid of new things, that he should check himself. Besides for that, Deri is not my rav, nor was he ever my rav, and I have no intention to ask him what I should do. The fact that I am a Sfardi woman and Haredi does mean I necessarily am connected to Shas - Rav Shvavo should pay attention." I want to tell you, I am a Jew who believes, we are playing with fire, and you should know and accept that we believe it, that when they did not harm the Torah, there was quiet - quiet with security, Syria was a distant country, there was quiet. The credit rating of the State of Israel went up, from a financial standpoint everything was excellent. They began to harm the Torah - suddenly Syria is very close, rockets are suddenly pointed at Tel Aviv, I believe this with complete faith, and like me there are hundreds of thousands and maybe millions who believe this. There is no way to be smart about it, they harmed the Torah... forget about the idea of teaching us. We will not change even a hairsbreadth..
the Korean's interest in gemara still seems strange to me.. I always found the Cairo Geniza very intriguing..
different approaches.. even among brothers..
though plenty of people in the government were not happy with Lapid's threat. With his low polling right now after his budget cuts, he probably does not have much behind his threat of dismantling the government and going to elections... Danny Danon, the Deputy Defense Minister said Lapid's threats don't move us. We want real "equality of service" - the kind that includes everyone, even Israeli Arabs, not just for haredim. Defense Minister Moshe Bogie Yaalon also weighed in against Lapid saying that he is being so harsh on the issue of "equality of service" for haredim in order to make up for his mistakes with the budget cuts and thereby regain some popularity. 4. can Tesla take over Better Place charging stations? 6. what is keeping mashiach away? 9. would you kill an Amalekite? 11. first, understand "the burden"
16. why is it so important for charedim to learn secular subjects? The committee headed by Yaakov Perry to find a solution to "equality of draft", which has become synonymous with simply formulating a plan to draft the haredim, has been making waves. It has drawn more opposition in its final days, opposition from across the spectrum, than it has found support. MK Amram Mitzna (Hatnua) has now joined the group of those attacking Perry and his committee for missing the mark and even accusing them of hypocrisy and anti-haredi sentiments..
Mitzna counter-proposes something that I have said many times in the past. 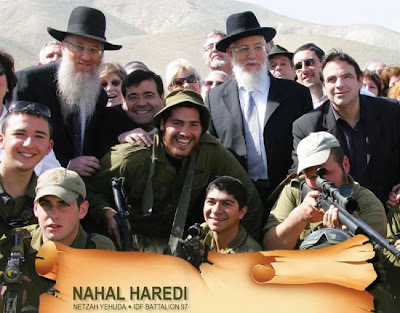 It is actually far more important to get the haredi community out into the workforce than it is to get them into the army. The army issue is an ideological one, and it will not be solved easily or quickly. After 65 years, these quick plans being formulated are turning into an ideological battle rather than an actual plan that could work. Sure, absolving them of army service is the height of unfair, when considering all those who are obligated to serve, but the real problem is not that they are not in the army, but that there are not enough of them in the workforce. The economy suffers because of it, they suffer because of it, the general population suffers because of it, etc. So Mitzna is proposing that the law that prevents someone from working if he/she did not complete their army service (whether in actual service or via an exemption of some sort) should be removed. He says haredim should be allowed into the workforce, immediately and without it being connected to army service. Obviously the army part of the issue cannot be ignored, as the entire country would be up in arms that they have to serve and one group does not with no obligation at all. Mitzna recommends that after releasing the haredim into the workforce, we can then look for ways to incentivize them to join the army. In my opinion this is probably the best solution. it solves the real problem, and it solves the problem that is fairly easily solvable. The army issue is also important, and the government should continue looking for a solution to it, but that should not stop the more important issue from being resolved.. There is a charitable initiative happening around the world. I don't know when it started, but it was big when Warren Buffet pledged to donate 99% of his wealth to charity. That is a considerable sum, considering his estimated worth is in the range of $46 billion. To date, he has already given away close to $13 billion, according to Forbes. Most of his money is going to the Gates Foundation, and some will also be going to a few foundations run by his children. In addition, Bill Gates pledged a large percentage of his wealth to charity, and together they founded the Giving Pledge through which they encourage wealthy people to donate at least 50% of their wealth to charity before they die. Sheldon Adelson, MOT supporter of Israel, Birthright, and especially of PM Benjamin Netanyahu (along with having given a lot of money to Newt Gingrich and Mitt Romney supporting their efforts to unseat Barak Obama from the presidency), has now made a similar pledge. Adelson is estimated to be worth $27 billion, and is in the top 20 wealthiest people in the world. His Deputy Director, Michael Leven, has now said that Adelson will be donating 75% of his wealth to charity. He disagrees with Buffet's style, saying Buffet chose to give the bulk of his money to the Gates family foundation to distribute, while Adelson prefers to donate the money to charities and institutions whose objectives are dear and important to him. Similar to Buffet, he believes he has left enough money for his kids and they don't need so much money that was earned by other people. Congratulations to Naomi Avraham of Jerusalem for achieving an internship at the United Nations. This internship had thousands of applicants, and it is a great honor that one of our own was able to qualify for it above and beyond all the other applicants. Avraham is a 21 year old Haredi woman studying in Machon Lev. She speaks four languages - English, Hebrew, Chinese and Yiddish. Naomi is one of ten siblings, studied in Bais Yaakov, and is completing her accounting studies at Machon Lev. The internship is for two months at the Department of Field Support (DFS) for peacekeeping missions, in the United Nations' budget office. Only 200 people from around the world are selected for such internships. The selection of Naomi Avraham, was, in addition to her general qualifications, due to her knowledge of Chinese. She studied Chinese, she says, because she considers it at least as important a language as English. Machon Lev, supremely proud of the achievement, has decided they would fund her entire trip for the summer UN internship. Machon Lev continues to make headlines with the success of their students. They must be doing something right. Sirens and Ululations: Will the drill mess up Hotovely's wedding? 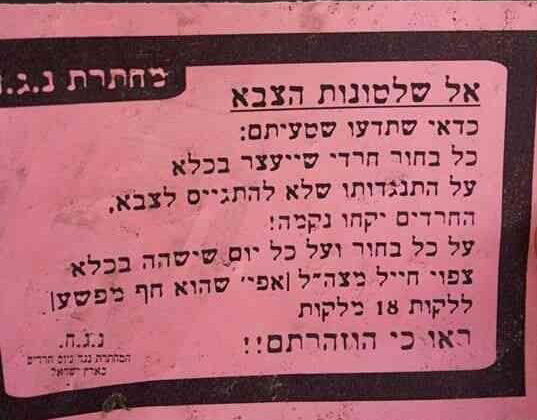 The chupa of the wedding of Hotovely and Alon is called for 7 PM. At 7:05 PM there is a national drill scheduled, with a siren to be blared, during which everyone is expected to head to their closest bomb shelter or sealed room. It is a good thing Israeli weddings, really most Jewish weddings, don't start on time. From the Rabbanut update: Does Palestinian Coca Cola require a hechsher? The item states that some coca cola is being sold in Israel with Arabic writing on the label and no kashrut certification symbol at all. These bottles are being sold at a cheaper price.. Upon investigation it has been found that this item is manufactured in the village of Kfar Bitunia, near Jerusalem with no kashrut supervision. The first reason to not consume this item is important - the item has no kashrut supervision and perhaps there might be a problematic ingredient. if there is, it should be pointed out what that is. Coca Cola is using just about identical recipes around the world - they want their product to retain a certain level of uniformity and the same taste everywhere, with perhaps slight changes to accommodate local markets. It should not be difficult for the Rabbanut, or Rav Landau who authorizes the Israeli Coca Cola, to find out what, if anything, is different about the PA Coca Cola. the second reason to not consume this, for educational reasons, is a crock. That is their way of keeping a stranglehold on the people even when it is not necessary. Foods that do not require a hechsher, and I am not saying this applies to Coca Cola, do not need a hechsher for educational reasons. I would say just the opposite - for educational reasons it would be better to not put a hechsher on so people can learn that certain foods are perfectly kosher and do not need external certification. This would apply to plain coffee (not flavored), regular beers (not flavored) and many other food items. I do not know if Coca Cola falls into theis category or not, but saying people should be trained to not buy food without a hechsher is false, unless they are saying this is an item that requires one. In this case of Coca Cola, they failed to make that case. Peres, who spoke of peace and dividing the land, upset some in the government for overstepping his position and for projecting his long-standing vision of peace, one that the people rejected when he was in politics, on the people of Israel. Minister Yuval Steinitz said Peres is not the government spokesman, and Minister Naftali Bennet said most Israelis reject a withdrawal to the 67 borders and understand it would bring Hamas terror to the center of the country. and part of the ceremony..
Hizballah should change its name to Hezb al-Shaitan -- "the Party of Satan." How can an organization's name could be Hezbollah (which means "the Party of God") while it declares a war to kill innocent men, women and children... Those who stand by the Assad regime and kill their own Muslim brothers, kill indiscriminately women and children in the battlefield, should not appeal to Islam and the Quran to legitimize their actions.. There is no difference between Pharaoh, who ordered the killing of newborn boys based on a dream, and today's Assad, who he accused of killing thousands of people in order to stay in power. This criminal is a real winner - of the Darwin Awards.. According to Globes, a criminal broke into an apartment in Ranaana. He went through the apartment wreaking havoc, causing a lot of damage. All the efforts he exerted causedhim to be so tired that he decided to take a nap. He went into the bedroom and fell asleep on the bed. The homeowner came home at some point, saw the state his house was in and went to check what was stolen. You can imagine his surprise at walking into his room and finding the crook taking a little beauty rest. The homeowner called the police who came and woke up Sleeping Beauty. Upon awaking, the crook asked the police for a cigarette.. I wonder if there is a tactic in play here. The Perry Committee has been meeting to formulate a plan for "equality of service", that would deal with all the issues of increasing the number of haredim drafted into the army, and making those exempt due to learning Torah the exception rather than the rule. It was looking like the decisions to be presented to the Knesset would be fairly harsh, and the Haredi parties and askanim were gearing up for a battle. Sure enough, at least based on what I read in the Mishpacha newspaper over Shabbos, at the last minute the Perry committee has decided to sfoten up their decisions a bit. The "decrees" won't be as harsh as originally planned. There was a list of changes, such as the institutions being sanctioned for not meeting the right numbers of draftees produced rather than personal sanctions, the target numbers were lowered a bit, etc. The past few weeks had all the talks of general budget cuts and especially budget cuts applied to the haredi community, to the haredi educational systems. The picture painted was that the budget cuts would be very harsh on the haredi community. If it was being painted as harsh by the Finance Minister and his people, from the side of the haredim it was being painted as much worse. Yet, at the last minute things were changed, some budget cuts were canceled, some delayed, some altered. And it passed with little serious opposition. it seems that the Haredim, while smarting from the cuts, figured they had at least lessened the damage and it could now be lived with. And now the same is being done with the issue of the draft. Talk was of very harsh changes, "decrees" as they are being called in the haredi media, and at the last minute things are being changed, decrees are softened, the decisions are made more palatable. It might be in my mind alone, but I suspect that this is a tactic being used. By talking everything up and making it look really bad, when they come in and soften things at the last minute, both sides get satisfaction out of the conclusion and it passes easier. Wow! This is one of the latest pashkevils up in RBS B... against Superbus for the evil crime of operating a bus line (bus #17) through the neighborhood that also goes to the secular parts of the city. In the words of the pashkevil author, Superbus by doing so has opened up the gates of the lewdness of the streets into the neighborhood! I would note that bus #14 has always operated on the route from RBS A through RBS B and into all areas of Bet Shemesh, so the presence of a bus from RBS B to the secular areas is really nothing new. They threaten that if the bus line is not canceled, the battle will be brought back to them and the good relations from which both sides have benefited will come to an end, that Superbus will be responsible for! I actually don't think this video is so great. I like JITC's "plugged" videos far better, but the point of it is good - don't let the mainstream media paint the picture they want, which often distorts the truth. This past week was supposed to see the ceremony of the conclusion of basic training for the latest inductees to the Nahal Haredi. It was canceled due to the fear that the event would be targeted by haredi extremists, who have begun a campaign of delegitimizing haredi soldiers, and even leading to violence against haredim seen in uniform. The even was rescheduled for tomorrow at 5:30 PM at Givat HaTachmoshet - Ammunition Hill - in Jerusalem. Somebody came up with the idea to turn this into a show of support. To oppose the calls against Haredi soldiers, and especially the violence, he suggests that people should show up at the ceremony and show their support of Haredi soldiers. He created a Facebook event to that effect, and it has received many shares on Facebook and has been picking up steam. I think it is a great idea, a great way to show support at a time when they are being threatened and future potentials are being scared away. If I could go I would, If you can go, I think you should. the latest is a story with very murky details.. a family of 8, 2 parents with 6 kids, "wandered" across the border into Jordan. It seems there is a restraining order on the father for being part of the Lev Tahor cult, and not being able to leave via the airports, he was trying to sneak out via Jordan and then to make his way with his family to Jordan. This family is from Bet Shemesh. The Jordanians took the family into custody and has returned them to Israel. The details of what and why are still murky, but what a strange story! Feldheim is having a big sale for the next few days - 20-80% off of kids books.. just until Tuesday night at midnight (NY time, giving us Israelis a little more time) though, so take advantage now! It might just be a trickle, but little by little it is happening. One woman here, one woman there, demanding the equality they feel is lacking. Whether it is for more public respect, for more public presence, no more separate seating (outside of some select places like shuls, etc), advertising, whatever. 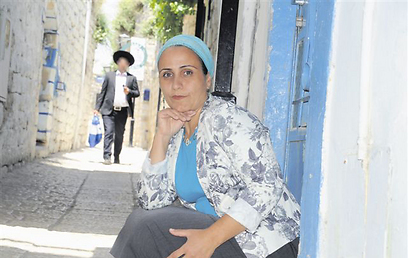 A haredi woman in Tzfat is now running for a seat on the City Council of the city. She says she has been receiving threatening calls pressuring her to cancel her campaign, but she insists on running. Shira and her family moved from France to Tzfat less than a year ago. She admits that being new to Tzfat can be seen as a problem, but she prefers to see it as someone bringing a different perspective with a clean slate. and the statement she ends the interview with is the one that might get her into the most trouble. She says, "I am following what is happening in the "Country club" in Tzfat recently, and am very angry. As a religious woman, I do not understand what the haredim care about that place being open on Shabbos... I would be happy if everyone would live as they wish to and respect the others. It also does not bother me if a coffee shop would be open on Shabbos, if it does not bother a secular person that I go to the mikva, for example.". Protexia is the secret weapon of most Israelis. It is sometimes known as Vitamin P. Protexia opens doors and opportunities that are normally sealed shut. But protexia does not always work. And I don't think there is anyone with more protexia than Avner Netanyahu, son of Prime Minister Benjamin Netanyahu. According to the news report, Avner Netanyahu applied for a job at a pizza shop in Jerusalem, but his application was rejected. Young Netanyahu was willing to do whatever work would be asked of him, but they had to turn him down due to his not being licensed to drive a moped. Every employee, according to their hiring rules, must hold a moped license. No exceptions. not even for the Prime Minister's son. What a silly decision! Had they hired him, maybe the Prime Minister would have moved over his ice cream budget to be spent at this pizza shop! Or maybe unemployment is worse than we thought - even the Prime Minister's son can't get a job! In the previous elections I was the sole alternative for Prime Minister, and I have no doubt that I have remained the sole alternative. Forgoing the ego, even if just temporarily, and going in a partnership to bring about change is my true objective on the way to the office of Prime Minister... Yes, it is just a matter of time... In the meantime I am preparing for the position of Prime Minister. I am the only one who is appropriate for the position. I particularly enjoyed his argument in favor of legalizing Cannabis (marijuana), and his comments about Arafat..
Who stars in this bank robbery movie? The Beis Din HaGadol has upheld a psak of a minor Beis Din that had ruled regarding a person who is withholding a get from his wife that he should not be allowed to be buried in a Jewish cemetery. The specific case is of a person who has withheld the get from his wife for nearly two years, and he has since run off to the USA. The beis din has already ruled that he should not be offered any consular services in the embassy or consulates in the USA. I wonder how strictly the consulate clerks adhere to the ruling, but that has so far failed to persuade or pressure this guy to give the get. The beis din has now ruled that they can create restrictions, including social restrictions, that are not already detailed within the purview of the beis din, including this new restriction to prevent him from a Jewish burial. I commend the beis din for thinking of new ways to pressure the husband to give the get, but I wonder whether this will have any effect. What do you think? Does someone like this think or care about a burial he probably isn't concerned about right now, thinking his death will only come in 40, 50, 60, 70 years down the line? The 70th anniversary of the Warsaw Ghetto Uprising has renewed interest in many of the stories and incidents that occurred in Poland during the Second World War. Every time that it seems that there are no new stories to be told, another, previously unknown episode seems to come to light. This was the case of the Irena Sendler story. Although Irena Sendler managed to save almost three times as many Jews as Oskar Schindler, the account of her activities was almost lost to history until a group of Kansas schoolgirls unearthed the events as part of their general research of the Holocaust and publicized the story. Irena Sendler was a young social worker in Poland when the Nazis invaded. She immediately joined the Polish underground, the Zagota, and undertook daring rescues of fleeing Jews -- researchers estimate that she was involved in the escape of over 500 Jews during this period. When the Nazis created the Warsaw Ghetto Sendler obtained false documents that identified her as a nurse, enabling her to enter the ghetto as a specialist in infectious diseases. Sendler brought food and medicines into the ghetto but as soon as she realized what the Nazis intended to do to the Jews, she began to play ways to save as many of the ghetto children as possible. Sendler walked through the ghetto every day, speaking to parents and convincing them that, unless their children were removed from the ghetto, they had no chance of survival. In her own words she "talked the parents out of their children." Many of the children that Sendler rescued were already orphans when she found them and, each day, she would smuggle a new group of children out of the ghetto, sometimes by sedating them and carrying them out in a bag or a toolbox and other times by hiding them under her legs as she sat on a city tram. There were additional smuggling sites as well including through sewer pipes located under the city streets and via the old courthouse that was situated along the ghetto border. Sendler documented each of the children that she rescued by writing their real name on tissue paper and sealing these names in jars that she buried in her garden. Sendler hoped against hope that she would be able to reunite the children with their families at the end of the war but if that proved to be impossible, to at least return them to their Jewish community. Sendler was arrested and tortured by the Gestapo in 1943 but did not reveal any information about "her" children. She escaped from prison and spent the rest of the war in hiding. Sendler's story was uncovered by a group of schoolgirls in 1999. Their discovery propelled them to create a project, Life in a Jar, which tells the story of Irena Sendler. The project together with the assistance of the Lowell Milken Center has developed into a website, a book and a play which is performed many times each year for audiences around the world. I am going to submit a proposal to cancel the television tax, for every shekel that the citizens of Israel spend for television is a waste of money and theft from the public monies. It is like bringing a dinosaur here and thinking that everything should function as it did millions of years ago.